Take a bit of time to make the springtime Easter holiday just a bit more special. Making — and decorating — cakes is a great way to celebrate. Bake and decorate any of the cakes here for a festive holiday treat. For the most part, these treats are easy to put together and you don’t have to be a professional decorator to make them look great. Get the kids involved and see how far the fun goes! This is the cutest thing we’ve seen in a while — a cake that looks like the sweetest little lamb surrounded by his own little patch of grass. 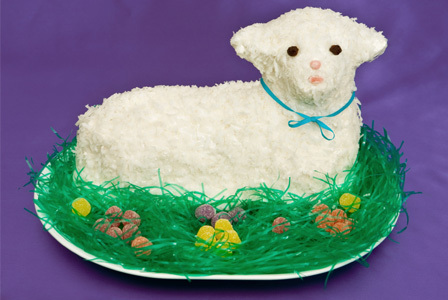 This cute lamb cake from Wilton is easy to put together. Aside from the shaped pan, there isn’t anything too out-of-the ordinary you’ll need for this treat, and your guests (especially the littlest ones) will love this Easter creation. Wilton is one of the leading cake crafting companies in the industry. From baking to cake decorating to candy making, you’ll find fun products at Wilton to harness your inner pastry chef! You’ve probably seen (and taste-tested) a cake pop or two in the past year or so. They’re easier to put together than you think, and you can create just about any theme you can imagine. With a few baking supplies, you’ll be ready to proudly display and serve your Easter egg cake pops! Bake the cake according to package directions. When it has cooled, add it to a large bowl and crumble it into small bits. Add most of the frosting to the cake crumbs and use your hands to mix everything together so the mixture is moist enough to form a ball that will hold together. If you need more moisture, add more of the frosting. Begin to form the dough into balls that are about 1 inch in diameter. Work each ball into the shape of an egg. When all the “eggs” are formed, place some parchment or waxed paper on a baking sheet and lay your eggs on it. Freeze the eggs for about 30 minutes. Stick your lollipop sticks into the larger end of your egg. Melt your candy disks; one by one, dip each of the eggs (with the sticks attached) into the melted candy. Allow the excess to drip off and hold each stick until the coating hardens (this should only be a short time). As you move to the next egg, gently lay the coated egg on a baking sheet lined with parchment or waxed paper. Put the extra melted candy coating into a pastry bag with a small plain tip. Use this to apply designs on your egg, then use the sprinkles to cover the designs. If you can make a cupcake and tie a ribbon, this treat will be a cinch for you to put together. From Disney Family Fun, this cupcake basket is so cute! You’ll need the following: a dozen cupcakes, white frosting, shredded coconut and green food coloring. You’ll also need some white pipe cleaners (to form the basket handles), jellybeans to put “inside” the baskets and some ribbon to tie on the handle for added cuteness. It doesn’t get much easier! Try this SheKnows recipe that’s not exactly a cake, but sort of. Carrot cake cookies are strikingly similar to the cake version, but you won’t have to worry about how big to slice them. For some extra fun in the decorating department, check your local craft store for small candy carrots. Then get your hands on a bunch of fresh parsley. Add one carrot to each frosted cookie, and top the carrots with a small sprig of parsley — too cute! If you can’t find candy carrots, consider piping them on using orange-colored frosting and a pastry bag. This is another SheKnows favorite recipe. Could it be because creamy strawberry angel food cake is delicious or because it’s so easy to make? This cake is a beautiful Easter treat with its cream filling and seasonal strawberries. The decorating is simple: Pull out the pretty cake stand you keep for special occasions like Easter. Set aside a few of the nicest-looking strawberries with their tops attached and place them every few inches around the base of the cake. The sliced strawberries and cream take care of the rest!